10" Gramercy Tools hand-cut cabinetmaker's rasps, 16TPI and 25TPI, flat side up. Click on any of the photos for higher resolution view. You might wonder why you should spend over $100 each for rasps. Or more likely, your spouse might. What could be simpler than a lowly rasp? Well, it turns out there are higher order rasps. Last week I shaped the first cabriole leg for my Queen Anne foot stool project. My sculpting tools were a rough Nicholson rasp, a cheap 4-in-hand rasp, a round Surform rasp, and a half-round metal file. It took me quite a while to do the final shaping, primarily because the first two rasps left such a rough surface that I was afraid to go too heavily with them. 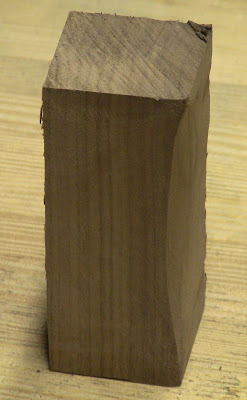 The Surform was much lighter cutting in the hard walnut. The file left a nice surface, but cut very slowly. Having seen Phil Lowe using good cabinetmaker's rasps in his videos, I decided it was time to upgrade. I went to the Tools for Working Wood website to see what they had. The only name I really knew for high-quality rasps was Auriou. I knew they were expensive, but I was prepared to pay for quality. 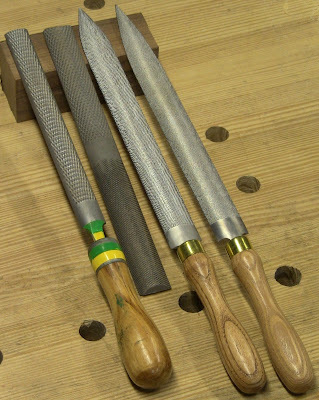 However, Tools for Working Wood also carries their own Gramercy Tools rasps, which looked very nice. I agonized over the choice. I've been impressed by other Gramercy Tools products, so I knew their rasps were worth considering. The price difference between the two was negligible. The deciding factor was in Joel's blog post More Stuff About Rasps, where he compared them. Because the Gramercy rasps are made from stainless steel, the teeth are stronger, so there's less chance of breaking them. I ordered the Gramercy Tools 10" 16TPI and 25TPI rasps on Friday, and with their usual alacrity, they arrived today, Monday. I put them straight to a quick test, comparing them with my cheap rasps. The contenders in order of coarseness, round side up: unnumbered Nicholson, no-name 4-in-hand, and the Gramercy Tools rasps. For the first test, I took 10 full-length straight strokes with each tool, trying to use consistent force, along the radial axis on a piece of the walnut I used for my stool legs. For the second test, I repeated that sequence on the heart-side tangential face. On the radial axis (i.e. across the rings). On the tangential axis, heart side (i.e. the concave side of the rings). This was the face I had found most time-consuming shaping the stool leg. The photos show that the first three rasps remove rougly the same amount of material. However, the Gramercy leaves a much finer surface. The Nicholson was by far the worst, leaving a ragged surface that looked like it had been clawed by rabid dogs. Even the no-name 4-in-hand was a better choice than that one. The fourth rasp, the fine-tooth Gramercy, left a very nice surface that would clean up easily. For the third test, I spent five minutes sculpting the two faces with the 16TPI Gramercy, then 1 minute cleaning it up with the 25TPI Gramercy. After sculpting the same two faces. The coarser Gramercy cut quickly, and the finer one left a very clean surface. If this had been a rough-sawn cabriole leg blank with just a little stock left to remove, that probably would have been enough time to do most of the final shaping, leaving an easy scraping job. I'm certainly not an experienced judge of rasps, but I'm very pleased with my purchase. These should do a much more efficient job on the remaining legs for my foot stool. I'm sure my spouse would approve! Very glad to hear these perform well. I would love to see some side-by-side comparisons with Aurious, though. I've been very pleased with my other Gramercy tools (dovetail saw, bow saw, holdfasts). Also, on the West Coast, TFWW does not deliver quickly, though I do not hold them at fault in any way. Seems all the good tool companies are in the Northeast... here in the Northwest, waiting a week or more is common. Not complaining though, I still remember the days where one mailed in a check (and order form... remember those?) and waited 6-8 weeks! Steve - very cool. I didn't know Gramercy had their own Rasps - love their stuff in general. 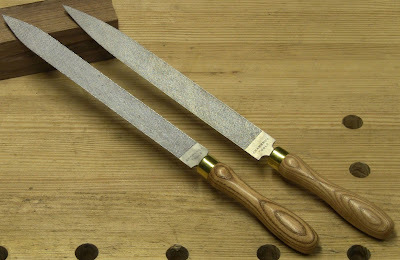 If you want, I can bring by a couple of Auriou rasps that I have for yet another in-house side-by-side comparison. I've had their sawmaker's rasp for a while now and I really like it. 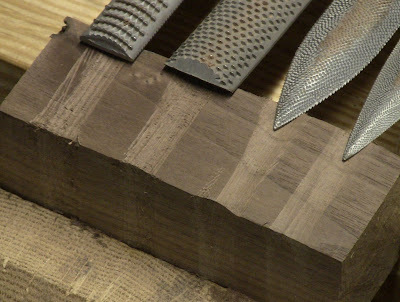 It and my Shinto saw rasp (quite a crazy tool) currently handle all of my rasp duty. One of the nice things about them being made of stainless steel is that you can put your mitts all over them and they won't rust. A larger one from them is on my list of things to eventually get (the saw rasp, not being half-round, isn't ideal for tight concave curves). Apparently they're all made by just one guy. Steve, one of the things I wanted to do at WIA this year was try out these rasps and I was successful. I have 2 Aurious and have been extremely pleased with them for the past year. I can honestly say that there is a negligible difference between Gramery and Auriou after working with Gramercy's model for about 10 minutes at WIA. Can't go wrong with either Grammercy or Auriou, but I think you'll be happier with a coarser grain for shaping cab legs. I use a 12 inch #4 grain for initial shaping...it's a beast, but that's what you want for hogging off material quickly and getting the thing shaped. Same concept as scrubbing before truing/smoothing. Funny I was just looking for Rasps yesterday at my local ww shop. They have new and used tools, but I did not find a lot of rasps. I don't really have a project for any right now, but I was doing some window shopping. 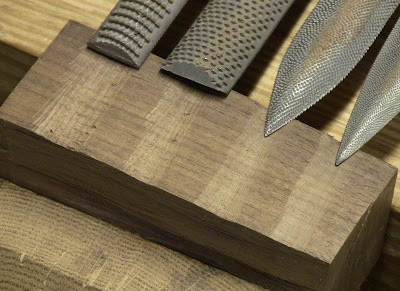 Rasps remove lots of wood fast, but they are gauged in graduating degrees to allow you to work your way down from heavy to light finishes. Some of the finer wood rasps can even polish the wood.